Fenella agrimoniae Brischke, 1888. Schriften der Naturforschenden Gesellschaft in Danzig, N. S., 7 [1888-1891](1): 6-12. Leaf miner: Full depth transparent blotch without a clear preceding corridor, quickly and strongly widening from the start. Frass in sausage-shaped granules. Often several leaflets of a composite leaf each have a mine (Bladmineerders van Europa).The mine is also illustrated in British leafminers. Larva: The larvae of sawflies have a head capsule, chewing mouthparts with opposable mandibles, six thoracic legs and abdominal legs (although they may be reduced) (see examples). 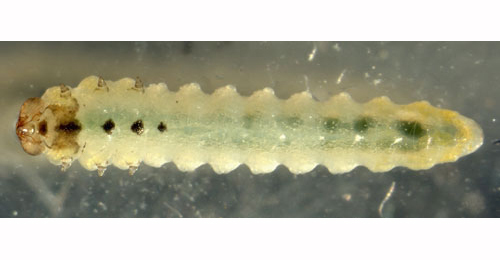 The larva is illustrated in Bladmineerders van Europa and British leafminers. Pupa: The pupae of sawflies have visible head appendages, wings and legs which lie in sheaths. Comments: Potentilla palustris is treated as Comarum palustre (Marsh Cinquefoil) by Stace (2010). Time of year - larvae: Bivoltine: summer and autumn (British leafminers). Time of year - adults: Unknown. Comments: Full synonymy and references are listed in ECatSym - Electronic World Catalog of Symphyta. Distribution in Great Britain and Ireland: Britain including Bedfordshire, Buckinghamshire, Caernarvonshire, Cardiganshire, Surrey and West Cornwall (NBN Atlas). Also recorded in the Republic of Ireland (van Achterberg in Fauna Europaea). Distribution elsewhere: Widespread in continental Europe including Austria, Belgium, Bulgaria, Corsica, Croatia, Czech Republic, Danish mainland, Estonia, Finland, French mainland, Germany, Hungary, Italian mainland, Poland, Romania, Slovakia, Spanish mainland, Sweden, Switzerland, The Netherlands. Also recorded in the Nearctic region (van Achterberg in Fauna Europaea).